Instead of just using semisweet chocolate chips, I took the opportunity to "clean out" my chocolate stash, using a mixture of chocolate chunks, semisweet chocolate chips, and bittersweet chocolate chips. I like the variety. That's why you see different colors and shapes of chocolate in my cookies. The cookies spread less when you bake the dough on silicon mats. I hadn't really noticed this since I almost always bake cookies on silicon mats but when I incidentally baked a couple on parchment, I noticed those spread more. Although it may be more convenient to use parchment in this recipe (easier to slide the entire sheet off to cool right after baking whereas silicon mat will be hot straight out of the oven), I prefer a thicker cookie so I go with the silicon mat. I baked some of the cookies (the ones used for this post) after chilling them about 45 minutes and they turned out just fine. I also baked some after about a day in the fridge. Maybe it's in my head but I think an overnight chill makes cookie dough a little more flavorful, and they bake up a bit darker. I would recommend it but it's not totally necessary. Like with most chocolate chip cookies, these are so good fresh from the oven, still vaguely warm! I hope I gave you a good excuse to bake up a batch of chocolate chip cookies soon, and maybe you'll give this easy Mrs. Fields recipe a try! In a medium-size bowl, whisk together the flour, baking soda, and salt. Place sugars into the bowl of a stand mixer and combine on medium speed. Add cold butter and mix until a grainy paste forms, scraping the bowl as necessary. Add eggs and vanilla, mix on low-speed until just combined. Add flour mixture and chocolate chips. Blend at low-speed until incorporated; do not overmix. Chill cookie dough for at least 30 minutes. Preheat oven to 300 degrees. Line a baking sheet with a silicon mat or parchment paper (I find cookies spread less on a silicon mat). Drop 1/4 cup mounds of cookie dough, using an ice cream scoop, onto the baking sheet, spacing cookies at least 2 inches apart. Bake for 18-22 minutes, rotating the sheet pan midway (bake time can vary - official recipe suggests 20-22 minutes though I found mine were done closer to 18 minutes). The cookies are done when they are set in the middle and golden brown, particularly along the edges (Mrs. Fields recommends the "touch method" where the cookie should bounce back when lightly pressed in the center). Immediately transfer cookies on to a cool surface by carefully lifting silicon mat (it'll be hot straight from the oven) or sliding entire sheet of parchment paper with the cookies on it to a wire rack. Let cool for about 10 minutes, then remove individual cookies onto wire rack and/or eat right away (as you might expect, these are excellent fresh from the oven). Hi Monica, chocolate chip cookies are my all-time favorites, these look delicious. Great tips, though I have a question......should the butter be right out of the fridge and then blended straight away with the sugars? It is so much harder to blend that way, but if in the end you get these great cookies it's worth it. Well, I have never had Mrs. Fields Chocolate Chip Cookies but they sound and look absolutely yummy! They would definitely bring a smile to everyone’s face! A good solid chocolate chip cookie is a wonderful thing, right! They look so good Monica! The generous amount of chocolate chips certainly makes them all the more tempting for me. It's amazing that you have the tips and secrets to make such great cookies. I'd love to try them. It's been ages since I've seen a Mrs. Field's store. These cookies look terrific, and thanks for sharing all the tips that made them a success. Cold butter - who would have guessed? I actually passed by one yesterday and it was early so no huge aroma cloud in the air yet. : ) I have such good memories of them...fresh baked definitely helps and this recipe is a good one, I think. I used to remember walking by their kiosk things at the malls all the time as a kid! And my sister and I would always beg my mom for a cookie (or better yet - one of the cookie cakes!! haha). 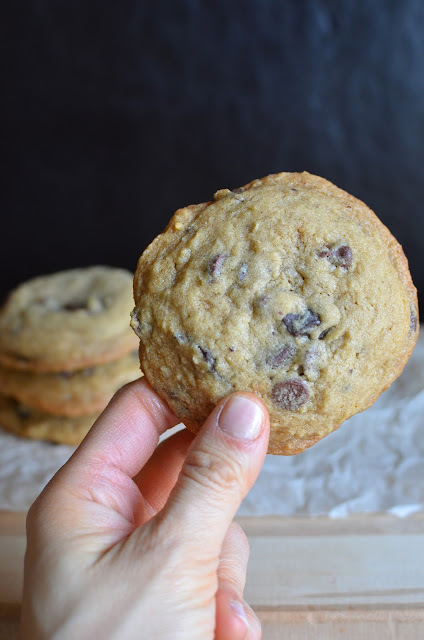 I love playing around with different flavors but I think chocolate chip cookies are probably my absolute favorite! These look awesome! Happy Friday!! We got our little one one of those cookie cakes for one of his preschool birthday parties, with a teddy bear face...it was so cute and so tasty! : ) The kiosks are a lot harder to come by now so it was fun to see this recipe and make it at home for fun. They were mighty tasty. Have a great weekend, Ashley! I have never had Mrs. Fields choco chip cookies...Can't wait to give your recipe a try, Monica. You've sold me - what a GREAT review of these cookies. I bet they did smell amazing while baking. I love everything you described. I've always chilled my cookie dough before baking and often scoop them into balls and then chill. These have a great visual appeals and the texture looks great. Perfect - now I'm going to have to dig into my lunch! I never really realized the purpose of the cold butter in recipes that call for it. I understand it a little bit better now - so interesting to think there's some science (that I can barely understand) behind so many facets of baking. Mrs. Fields is good stuff! I love Mrs. Fields cookies and I am completely intrigued by the low cooking temperature. Cannot wait to try this recipe! That was the most intriguing aspect for me, too. It works! 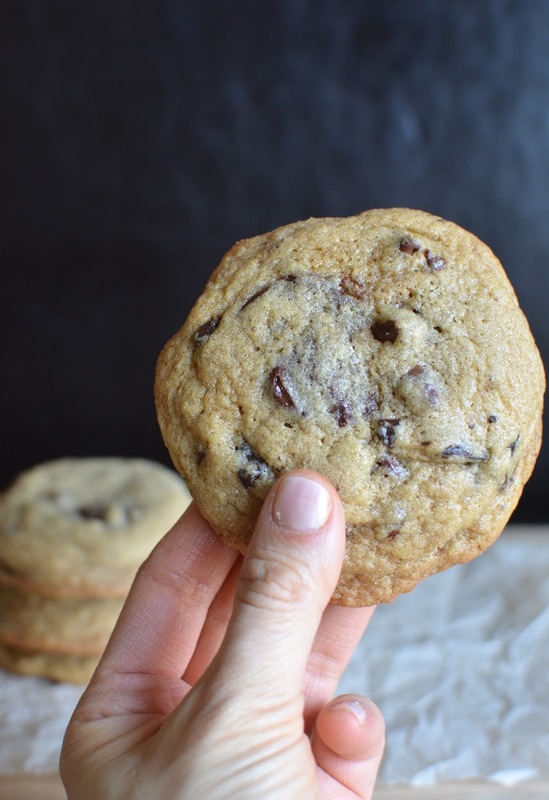 There's not much better than a perfect homemade chocolate chip cookie. These look so so good! I know...just need to make a batch of chocolate chip cookies every so often. Nothing like a fresh batch from the oven. Thanks, Aimee. Hope all is well! Ahh there's nothing quite like a Mrs. Fields cookie. One of my friends received a get-well package of Mrs. Fields cookies, shaped as flowers and butterflies, as well as ginger and chocolate chippers. And boy was I jealous ;) I'll have to try out this recipe so I can make my own Mrs. Fields cookie at home! Thank you for sharing! 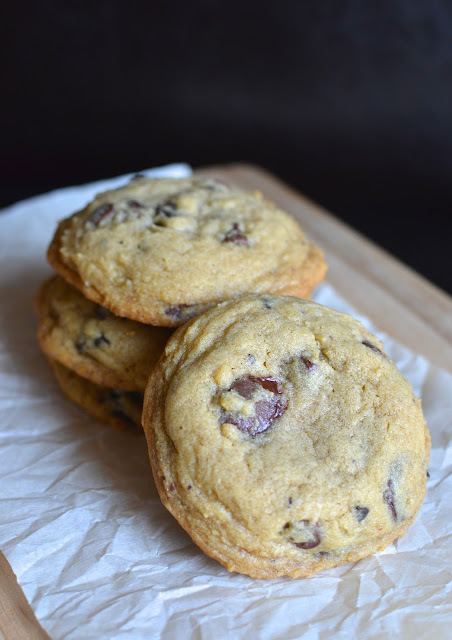 I'm having a chocolate chip cookie moment lately - many of them and all good. Thanks, Monica!